I am passionate about using data visualization, information design and digital media for social and environmental causes – especially in areas such as education, health, civil rights, poverty reduction, sustainability, transparency, accountability, citizen engagement and data journalism. I love data-driven 'Graphics with a Cause'. I am an assistant professor and co–coordinator of the multidisciplinary data visualization curriculum at the University of Amsterdam. My CV is here. A visual impression of a few of my projects is here. I am Co-Founder of Show Me The Data, Associate Fellow of the Communication Research Institute, and a member of various international committees, including the Editorial Board of the Information Design Journal. At the University of Amsterdam I am part of the New Media group, where we teach, supervise theses, research and visualize what is happening on the webmobile / social media. Having studied and taught data visualization for more than 20 years, I have, among other topics, been working on how visualizations use spatial positioning to convey meaning. My work is quoted by Colin Ware, Stuart Card, Jock Mackinlay, Ben Shneiderman and others. My concept of "meaningful space" in visual representations has been adopted by Dave Gray as a key principle of "Gamestorming". I have had the pleasure of presenting in many countries of the world, sharing the stage with Hans Rosling, Alberto Cairo, Manuel Lima, Lev Manovich, and many other 'visualizers'. Over the years I have greatly enjoyed my personal discussions with inspiring people such as Jacques Bertin, Nigel Holmes, Jorge Frascara, Richard Saul Wurman, Donald Norman, Stephen Few, etc. I hold a Ph.D. in Computer Science (Department of Computational Linguistics, 2002), and an M.Sc. in Medicine (1990). The upcoming book 'About Information Design' includes my recent texts on 'Graphics with a Cause' and on the concept of 'Meaningful Space' as the quintessence of all graphics. 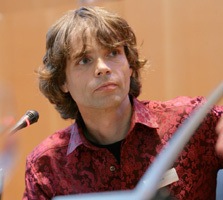 I enjoyed co-organizing and co-chairing Show Me The Data 2012, with Alberto Cairo, Jan Willem Tulp, and many others. I presented 'Engaging Citizens with Animated Statistics' at "Data Designed for Decisions – Enhancing social, economic and environmental progress" at the OECD in Paris, together with Raul Niño Zambrano. Hans Rosling and I had a good time discussing our shared passions: health, social change and data visualization. Since 2011 I also have the pleasure of being a lecturer in the Postgrado de Visualización de la Información at Pompeu Fabra University in Barcelona. Being a member of the jury for the national Infographic Award (NVJ & BNO) has been an inspiring experience (link, link). I had the honor of giving the invited opening keynote lecture at the 4th International Conference for Information Design, in Rio de Janeiro. I had fun participatng in the Data Stories podcast #14. We presented at Mediafonds@Sandberg's Follow the Money. Lev Manovich, Raul and myself, and a couple of other speakers presented at Infodecodata. Dave Gray (of XPLANE and VizThink) writes "Yuri is at the forefront of visual thinking research". Thanks, Dave! We enjoyed Manuel Lima's visit (of VisualComplexity.com), who came to present in the data visualization course that I am coordinating (Manuel has posted one of our student projects). I gave the opening lecture, 'From educational posters to animated and interactive graphics', in Ljubljana, of a series of presentations on information design. I was followed by other speakers including Rob Waller and Jorge Frascara. My critical review of Edward Tufte's Beautiful Evidence is still receiving a lot of visitors every day. See the presentation that Raul and I gave at the International Documentary Film Festival Amsterdam and a few brief posts that I wrote with Raul: Genocides jumping off the chart, Panorama of news headlines, Squared global inequalities, and The crowdsourcing of crisis information (all in 2008). Moritz Stefaner about my Ph.D. work, The Language of Graphics: "I think it is a fantastic piece of work. [...] A great achievement [...] analytically really strong and I believe also quite novel in this form." Thank you, Moritz! Dave Gray calls it "the most thorough exploration and synthesis of visual grammatical forms I've ever seen." The book itself is out of print, but can be browsed and 'full-text-searched' here (a summary and some other information is here). Graphics – Neurath, Rosling, and the universal principles of visual representations (in print, 2012). Diagrams for the masses: Raising public awareness - from Neurath to Gapminder and Google Earth (with Raul Niño Zambrano). See here and here (first page also here). In: Diagrammatic representation and inference (2008). Network nations (with Ben Schouten) (scanned pdf). In: Else/Where (also here): Mapping – New cartographies of networks and territories (2006). Objects and spaces: The visual language of graphics. See here and here. In: Diagrammatic representation and inference (2006). A meta-taxonomy for diagram research (with Alan Blackwell). See here & here. In: Diagrammatic representation and reasoning (2002). Grundprinzipien grafischer Darstellungen. In: Navigation durch Text, Bild und Raum (2001). The other chapters are by Martin Krampen and other fellow speakers at "Forum Typografie 2000" in Hamburg, Germany. Meaningful space. In: If/Then: Design implications of new media (1999). Thanks to Google, see a few books that mention me / my work. Syntactic Structures in Graphics (pdf, 350 kB) (2007, also online). My critical review of Edward Tufte's Beautiful Evidence (2007). Meaningful space: How graphics use space to convey information (1998). A taxonomy of diagram taxonomies (1998). Formal specification of a graphic design theory (1997) (with D. Wang and H. Zeevat). Towards a design theory for visualization(1996). The visual grammar of information graphics(1996). In this paper I examine how visualizations use spatial positioning to convey meaning. I propose a distinction between quantitative spatial axes and nominal/ordinal spatial axes. I discuss how these two types of spatial axes can be combined to construct complex visualizations (Tableau software has meanwhile done a wonderful job of implementing this principle). This paper is quoted by Colin Ware, Stuart Card, Jock Mackinlay, Ben Shneiderman, and others. Programs in which I have been lecturing include Media Studies, Human-Computer Interaction, Journalism, Graphic Design, Science Communication, and others. Data visualization – our Show me the Data course. See our students blogging about datavisualization here and here. I have contributed as a curriculum developer and course instructor to the multidisciplinary bachelor's degree Future Planet Studies, which explores possible sustainable solutions for our current global challenges. New media analysis I, New media objects, Interaction design, Digital culture. Also, for many years now, I have been teaching Philosophy of Science, using collaborative visualization assignments and concept mapping. Information graphics in the MA program Editorial Design (also see here and here). Fifteen years ago, I co-taught Automatic visualization (1997) and Formal perspectives on visual representation (1996). Together with Juan Carlos Dürsteler (InfoVis) I have co-developed courses on information visualization for the Istituto Europeo di Design, for the Open University of Catalonia, and for the University Pompeu Fabra, Barcelona. I am founder and was moderator (1995-1999) of InfoDesign and InfoDesign-Cafe, the first international online discussion forums about information design (see here and here). I am on the Advisory Committee of the Brazilian Journal of Information Design, and on the advisory board of IMAGE - Journal of Interdisciplinary Image Science. I was assistant curator of and contributor to the InfoArcadia exhibition (1999-2000) (more info). My memberships of program committees have included the 3rd Information Design International Conference and the Diagrams 2008 conference. I participated in a (somewhat lengthy) VizThink webcast discussion about visual language and visual grammar (also here). Together with Christian Behrens of 'Info Design Patterns' I prepared a session on '(De)-constructing Infographics' for VizThink Berlin, see "Yuri Engelhardt speaking at VizThink", 'The Building Blocks of Information Visualization', and '(De-)Constructing Information Visualization'. My educational path has included elementary school in Australia, high school in Germany, college in California, and university in the Netherlands. I am a (close-to-) native speaker of English, German, and Dutch, and I also speak a bit of French and reasonable Spanish (which is continuously improving). So far my wife and I are raising our two young boys trilingually (Dutch, English, Spanish). In Unified Theories of Visual Representation Alan Blackwell refers to both my work and our joint work on visual language.